Is the Five-Hour Energy Drink Bad for You? If you've ever been to a convenience store, gas station, pharmacy or anywhere energy drinks are sold, you've probably noticed the tiny bottles labeled "5-Hour Energy" on a display next to the register. It sounds great -- rather than drink a 12-ounce can of a too-sweet energy drink, you could get your caffeine fix in two swallows. While the convenience factor is impressive, the 5-Hour Energy ingredients list may be cause for concern. Caffeine, which does have an effect on mental alertness, is a prominent ingredient in 5-Hour Energy. The problem is that the caffeine is listed as part of a proprietary blend, so you don't know exactly how much you're getting in each shot. The exception is the decaf shot, which contains 6 milligrams of caffeine -- still enough to cause a reaction if you are caffeine-sensitive. The label for the original shot says it has as much caffeine as a cup of coffee and the extra strength shot has as much caffeine as 12 ounces of coffee. This gives you a rough idea, but the caffeine content of coffee can vary from 100 to 300 milligrams per cup, leaving consumers in the dark as to the actual caffeine content of 5-Hour Energy shots. If you are sensitive to caffeine, it's best to avoid these products. The B vitamins work together to help you convert the food you eat into energy you can use -- you would be very tired without them. If you take multivitamins or a B-complex vitamin, you are already well-stocked on B-vitamins. The 5-Hour Energy shots contain varying amounts of niacin, vitamin B-6 and vitamin B-12 in doses thousands of times higher than your body needs. There is no evidence that extra B-vitamins provide any additional benefit, including increasing alertness. Even worse, some B-vitamins can cause unpleasant side effects in high doses. For example, niacin causes flushing; too much can cause liver damage and stomach ulcers. Too much vitamin B-6 can disrupt nerve and muscle function and excessive vitamin B-12 can cause diarrhea. The real danger of 5-Hour Energy shots is their small size. The instructions on the label indicate that half of a bottle may be enough for many people. But the small container makes you think you should drink the entire thing, possibly cause the adverse effects. In contrast, a cup of coffee provides the same caffeine as the original shot, but it takes longer to drink. Sipping coffee slowly throughout the morning gives you steady, but small doses of caffeine. With 5-Hour Energy, you get all that caffeine at once, and it all hits you at once. Because you haven't really consumed that much volume, you are more likely to go back and do it again. The 5-Hour Energy label says to limit consumption to two shots per day and to separate the doses by several hours. If you enjoy using 5-Hour Energy shots, treat them like a supplement, not like a beverage. There is some good news amidst all the potential dangers of 5-Hour Energy. The shot only contains four calories, meaning it's unlikely to affect your normal calorie intake. It's a better alternative than soda, which can pack 200 calories per can. The shots are also sugar-free, and it is this characteristic that's responsible for the "no-crash" feature of the shot. No sugar high means no blood sugar crash in a couple of hours, so you won't be left with a headache and lead feet toward the end of the day. The shots are also very low in sodium, unlike many energy drinks. 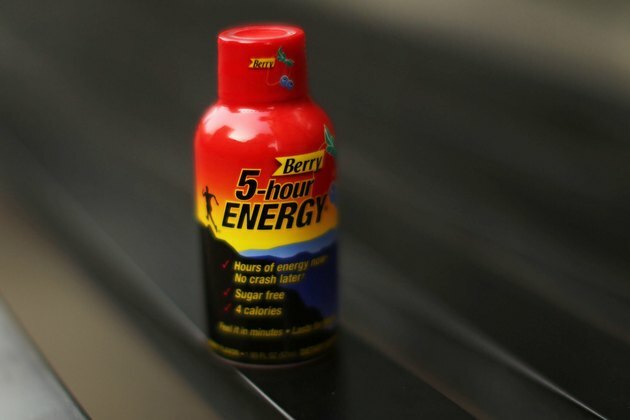 The Ohio State University Student Health Services: Is 5-Hour Energy Safe? Does It Work? What Are the Dangers of Taking Two Five Hour Energy Drinks in 24 Hours?